Villa Carramar, operated by Churches of Christ in Queensland, will undergo a multi-million dollar extension over the next 16 months. Turning the sod using the same shovel that turned the sod on the original construction of the Stanthorpe marked the official start of the project last week. 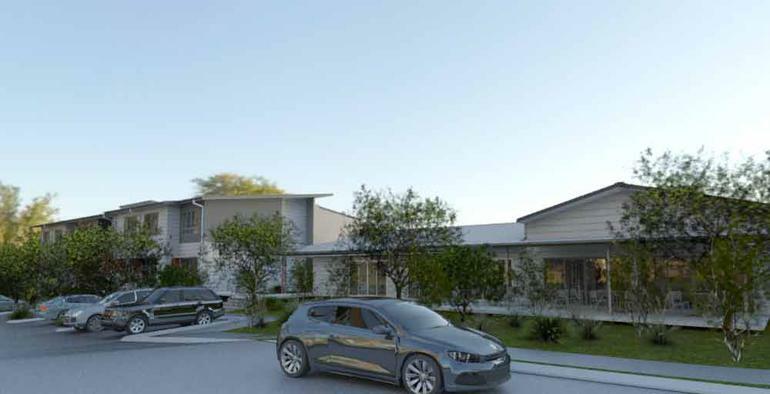 Churches of Christ in Queensland Chief Executive Officer Dean Phelan says the extension to Villa Carramar marks an exciting step in the organisation’s strengthening commitment to seniors in Stanthorpe and the Southern Downs region. “Expanding the service we provide at Stanthorpe was on our radar from when we first looked at purchasing Carramar. “When the only other provider of aged care in town closed down last year, we knew we had to act, and thankfully we can now commence work towards the provision of an additional 68 aged care places,” Mr Phelan adds. The extension involves the construction of 68 rooms, with the new wings linked to the existing building. Additionally the existing 16 room wing will receive alterations and refurbishment to match the overall development. The cottage style extension has been planned to suit both the local climate and also the unique needs of locals, and will feature accommodation incorporating dementia design principles. A multi-function community space, café and themed gardens with water features, garden art and raised garden beds will also be created. “What we are providing here is not only much needed specialised residential aged care, but an enhanced sense of community,” Mr Phelan says. Once completed in early 2018, the Alice Street service will provide care for 106 seniors, a clear demonstration of Churches of Christ in Queensland’s commitment to the region.